I love snowboarding. I love the snow, the speed and the sound your board makes as you carve through fresh powder. One of me and Mike’s favourite spots is the glacier on Whistler. You have to take a rope tow (not particularly fun on a board) and there’s a bit of a hike (actually, a massively steep hike depending on how much snow there is) but the reward is a giant bowl of virtually untouched snow. It’s immensely wide, which means you can spread out and pretty much do anything and everything. Last year I took a tumble as we were leaving the glacier. I was going along, at my not-so-fast pace, when I caught my edge on a patch of rocks. I fell pretty hard – so much so that a fellow skier stopped to see if I was okay. Mike hiked back towards where I was lying in the snow and we assessed. I was pretty much fine, just shaken up, but my helmet (thank goodness for helmets!) had a major dent in it, so I decided to sit out the rest of the day. I spent my time in the lodge where I had two big bowls of broccoli and cheddar soup. It wasn’t the most fantastic soup in the world, but broccoli and cheddar are one of my favourite combinations and I definitely needed some comforting. I’ve never made broccoli and cheddar soup myself, but what I do tend to make a lot of are broccoli and cheddar grilled cheeses. It’s hard to resist a grilled cheese sandwich and this one is pretty much the ultimate. I like cooking the broccoli just until it’s barely tender for a nice bite. 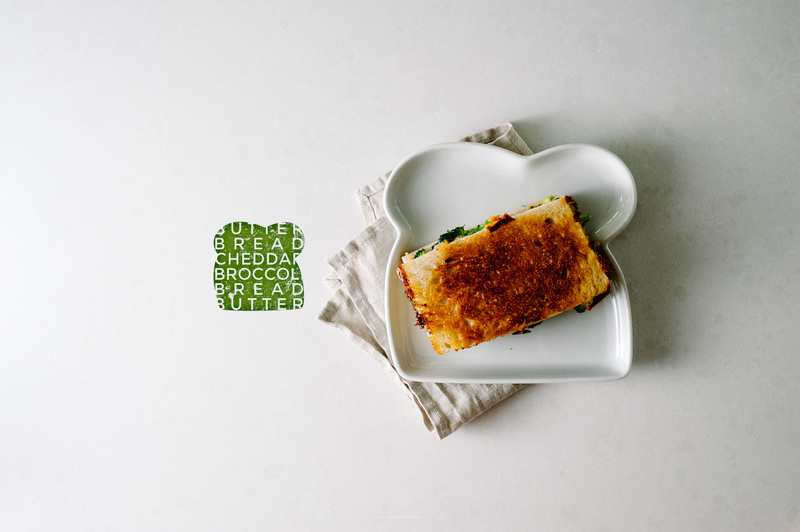 Bread, butter, broccoli, cheddar, salt and pepper. What’s not to love? In a small frying pan, heat up a touch of oil over medium heat. Cook the broccoli until bright green and tender, stirring occasionally. Season with salt and pepper. 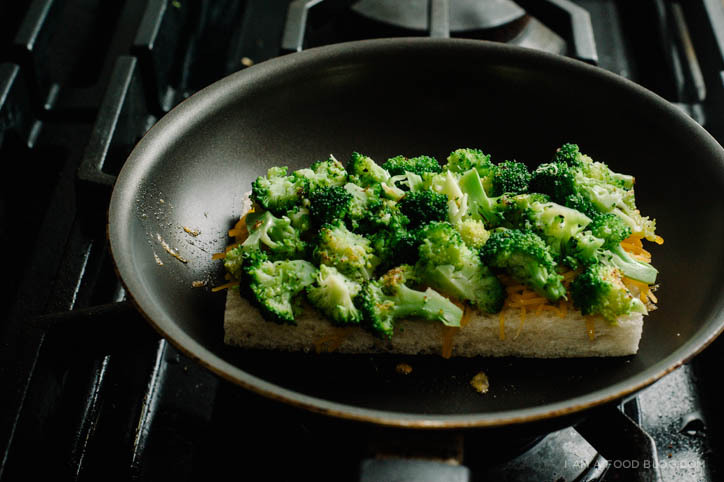 When your broccoli is done cooking, heat up a non-stick pan on medium-low heat. Butter one slice of bread and place in the pan butter-side down. Top with half of the shredded cheddar and the broccoli. Add the remaining cheddar on top of the broccoli, making sure to get to the edges. Butter the other slice of bread and place on top of the cheese, butter-side facing out. Cook slowly on medium-low heat until golden brown and toasty. Most of your cheese should be melted when it’s time to flip. Carefully flip your sandwich and continue grilling. The second-side grills a bit faster, so turn the heat down to low and keep a close eye on it. When perfect, remove from the pan, and enjoy hot! PS – Some other obsession worthy grilled cheeses: Pierogi Grilled Cheese, Classic Grilled, Crab Rangoon Grilled Cheese, and Grilled Egg and Cheese. I’m glad you are ok! This sandwich rules! I love your grilled cheese ideas…. we especially like the pierogi grilled cheese… one of the best things ever. This is likewise amazing! Oof! I’ve never been snowboarding but the one or two times I’ve gone skiing I’ve wiped out so hard. It’s like, I’ve always been an athlete so I would get going real good and then I didn’t know how to correct when it went wrong and a-tumbling I would go, cursing the whole way down. Aaaaanyway, I’ve never thought of putting broccoli on a grilled cheese sandwich. I dig this. I want to try it. This is so AMAZING! I never thought about adding veggies to my grilled cheese sandwich. Btw, thank you so much for dropping by my blog! This grilled cheese looks so tasty – I love the flavour! 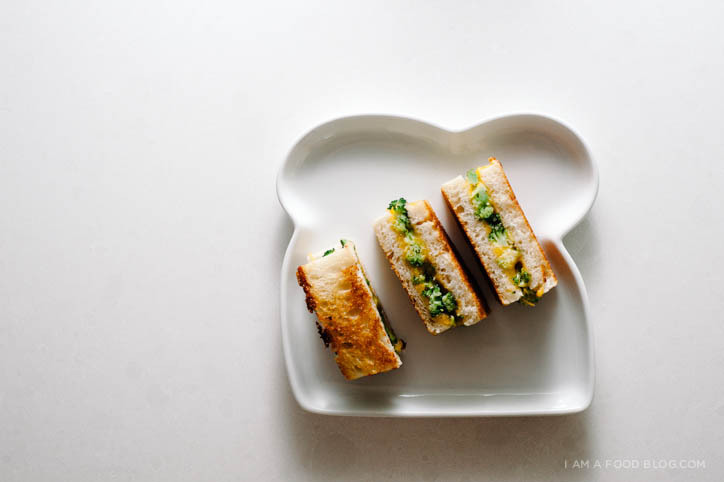 Love this kind of grilled sandwich for a Sunday evening snack! Thanks for the inspiration! What a perfect breakfast on the go, by the way, thanks for the share :) This will be one of my favorite breakfast. 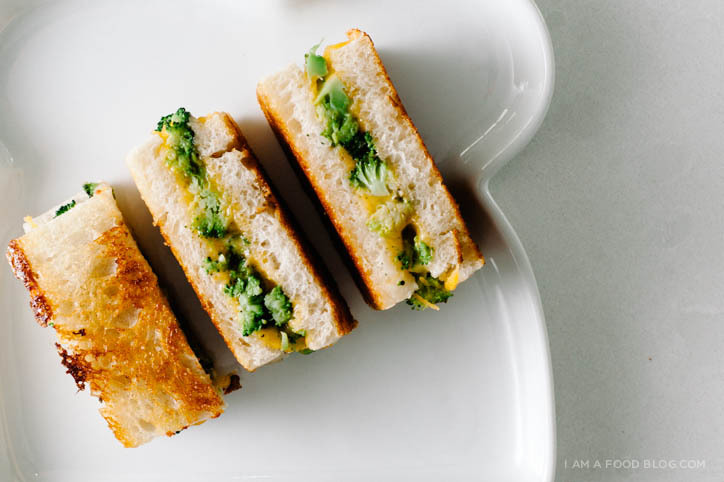 I have never seen broccoli and cheddar in sandwich form before. To me it sounds even better than soup! I made this and LOVED it! I don’t do dairy, so I made it with some rice based ‘Go Veggie’ fake yellow cheese sliced, and sautéed some broccolini that I happened to have in the fridge with a bit of cayenne pepper and salt. Yum x 100000! Thanks fr the great recipe. broccolini and cayenne sound awesome! Ouch, hope you’ve recovered well! I tried snowboarding for the first time a few weeks ago and loved it! Do you have any advice which alternative I could use? thanks so much!! 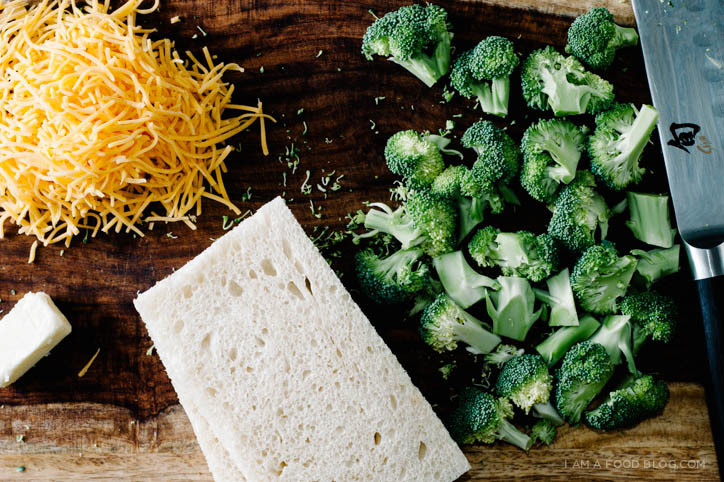 broccoli and cheddar is a super-common combination here in north america, but you can go ahead and use any kind of cheese you’d like! i recommend a semi-hard cheese, like gouda, swiss of gruyere. it’s hard to go wrong with cheese and broccoli so go ahead and experiment! hope that helps! 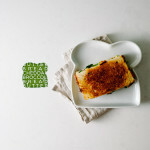 What a great way to make a grilled cheese a little healthier :) I also love your bread plate! I cooked the brocolie bright green on one side and had the other carmalized, it’s delicious and used by master chefs to add flavor to soup. Crispy kale and mozzarella instead of cheddar, and organic to!